Steve Longan was worn out on working out, so he started running with the other guys at the Los Angeles County Sheriff’s Department Special Enforcement Bureau. But running wasn’t fun for him. Then a friend told him about CrossFit. Eager to learn more, Longan suddenly found himself up against local athletes Kristan Clever, Katie Hogan and Becca Voigt. SEB CrossFit grew out of Longan’s inspiration, and the department recently granted the affiliate more space after it saw the effect CrossFit was having on officers. Before the affiliate was created, though, it started with just a couple of guys outside on a custom-made pull-up rig made by a local welder. They used a picnic bench for jumping, and they trained just outside the traditional gym. Their colleagues, who were doing bodybuilding movements inside, were able to watch Longan and his crew get fitter through the windows. “My advice for guys that want to start CrossFit for their agency or anywhere is just start doing it,” Longan says. “That’s it. 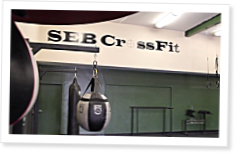 SEB CrossFit celebrated its expansion on Dec. 17, 2013, and CrossFit Inc. donated US$5,000 to help the affiliate continue its growth. Additional reading: CrossFit Training for Law Enforcement: Jacksonville Five Years Later by T.J. Cooper and Phil Canto, published Sept. 1, 2007.